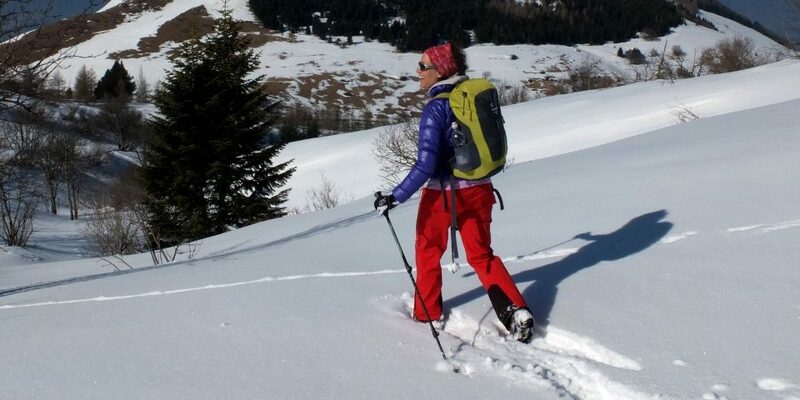 Snowshoe Excursions in Trentino and the Dolomites. Snowshoes are worn over ordinary hiking boots and by increasing the area you walk on allow you to move over the snow without sinking down. In the past they were used a lot by the nordic population to move freely across the snowy moors. Today the use of snowshoes is only considered a sporting activity To be in the woods taking slow steps in close contact with an environment coloured by thousands of ice crystals brings more and more outdoor lovers to turn off the television and breathe in a too often forgotten corner of nature. On request, excursions can be organised anywhere in Trentino and Alto Adige with night time excursions and dinner in typical mountain huts. Snowshoes and ski poles supplied by the guide. Arrivano le prime nevicate ed ecco il nostro programma di itinerari ed escursioni con le racchette da neve.